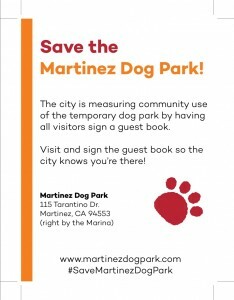 Martinez-Dog-Park-Final Please print and PASS OUT TO EVERYONE YOU SEE!!! *shout out to the Martinez Pet Food Express for creating this flyer!! The city would like to introduce the new sign-in sheet at the dog park. This will help them to get better information regarding the use of the Dog Park. Please sign in at each visit, let’s let the city know we are here! Remember, the city labeled this dog park TEMPORARY for 3 years. The city would like to confirm the dog park is a benefit to Mtz. 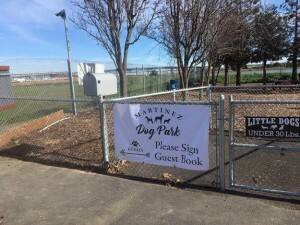 Sign-in sheet is left of the entrance near the small dog park next to the signage, the mailbox is where the sign-in binder is housed. The Parks and Recreation Commission requested information on the Park’s use multiple times, but we were not in a position to provide any accurate level of data regarding when people were using it, or how many people were using it, etc., other than anecdotally what we saw when we ourselves were down there or had heard from others. I think the basis for the questions from the PRMCC was just as to whether or not the Park was being used by the public, particularly given the time and effort that had gone into its conception/construction and the level of public interest that had been shown leading up to its development. So excited to see such great reviews on the new Mtz dog park today! Let’s let the dogs out!! I invite anyone who’d like to share their awesome experience at the dog park today & everyday to put that on Yelp??! 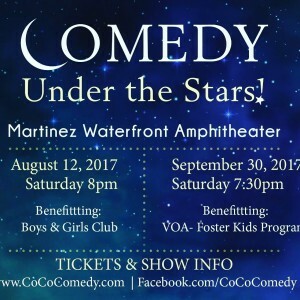 We need to get the word outside of FB & bring people to Mtz; this hidden gem needs to blossom. If this is your first time visiting an off leash dog park, there are a few things you should know ahead of time. This isn’t just dog park etiquette. This is important information to protect both you and your dog while at an off leash dog park. When you know what to do ahead of time, then you’ll be free to enjoy the day and have fun at the dog park! It’s up to you to make sure that your dog behaves properly at an off leash dog park. You cannot control what the other dogs do while they’re there, but you can definitely play a role in how your dog behaves. Your dog must always respond appropriately to “come.” If your dog doesn’t come when called, then you could be in for a scary situation at a dog park where there are lots of strange dogs and strange people! #2 Pick the right dog park. First, check with friends, neighbors, and online to see where the dog parks are in your area. Then, be sure to check out the dog park before you let your dog run loose inside. You probably don’t want to go to a dog park that’s not maintained. Some signs to look for are: overgrown with weeds, full of mud pits, dog poop, or broken toys everywhere. 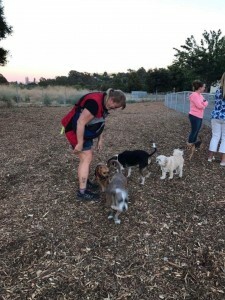 For your dog’s first visit to an off leash dog park, it’s best to go at a time when the park is not overly crowded with lots of dogs and people everywhere. Evenings and weekends tend to be the busiest times at dog parks. 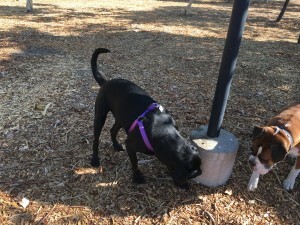 #3 Small dog parks are best for a dog’s first visit to the dog park, regardless of weight. If you have small, timid, shy, disabled, etc. dog, try to find a dog park that has a small dog section to play. Many small, timid, shy, disabled, etc. dog feel more comfortable there at first because in the large dog area dogs like to play rough and lunge at all dogs, so this will keep the everyone safe — especially on your first visit to an off leash dog park. There are also dog meetups, so you can find others with small, timid, shy, disabled, etc. dogs in your area! #4 Remove your dog’s leash. This may seem silly to point out, but some dog owners are hesitant to let their dog run free around other dogs that they don’t know well. However, keeping your dog on his leash can really stress him out. Plus, if you’re the least bit nervous, your dog can sense that right through the leash. So it’s best to just let your dog be a dog at the off leash dog park. As long as your dog responds to “come” and other basic commands, then you should have no problem corralling him in a hurry if need be. Another reason to remove your dog’s leash is the fact that he could get his leash tangled up with another dog, and one or both of them could get hurt. #5 Now have FUN with your dog at the dog park! For the most part, just stand back and watch how your dog interacts with other dogs, and how they interact with him. Watch the dogs’ body language. Occasionally, interact one-on-one with your dog by calling “come” every now and then. This reminds him that you’re in control, you’re there if he needs you, and you’re there to have fun. Finally, talk calmly and quietly to your dog in order to prevent your dog from getting overly excited or nervous. As soon as you sense that your dog is not having fun, then it’s time to leave. Dog parks can be a source of over-stimulation for some dogs (like sensitive or shy dogs). Introducing your dog to dog parks in small doses is best. It’s best to leave your dog’s own toys and treats at home, because they could cause fights and/or possessiveness. You may, however, want to keep one single treat (your dog’s all-time favorite) and/or a special toy (that your dog always reacts favorably to) hidden in your pocket. Should your dog not want to leave the dog park or if he becomes fixated on someone or some thing, that one item could be used to regain your dog’s attention. It is not recommended that you take kids to dog parks. Kids have city playgrounds and parks, dogs have dog parks. Children simply add another variable of uncertainty to the whole mix where strange dogs are interacting with one another. Plus, you never know how a dog is going to react to a certain child and/or how a certain child is going to react in the presence of a certain dog. It goes without saying that you need to pick up your dog’s poop. Play it safe by bringing your own dog poop bags, even though many modern dog parks have poop bag stations and waste cans for your convenience. Many dog parks are kept neat and orderly thanks to the dog owners who visit them. Do your part to make the dog park a pleasant place to visit. Some ideas: fill up empty dog water bowls (if there are any), gather random dog toys (if there’s a bin to keep them in), and walk by occasionally to make sure the gate stays properly locked at all times (so no dogs can escape).